Adenomyosis is the presence of functional endometrial tissue within the myometrium of the uterus. This benign invasion of the middle layer of the uterine wall has been described as a variant of endometriosis – and although the conditions can occur together, they are distinct diagnoses. The main symptoms of adenomyosis are menorrhagia and dysmenorrhoea, and it frequently occurs together with fibroids. Adenomyosis is found in up to 40% of hysterectomy specimens regardless of a previous history of pelvic pain and occurs most often in multiparous women at the end of their reproductive life (70% to 80% of cases are reported in women in their forties and fifties). The ectopic endometrial tissue is hormone responsive and therefore symptoms subside post-menopause. Adenomyosis describes the presence of endometrial tissue with the myometrium of the uterus. The invasion of endometrium can be focal or diffuse and is more commonly found in the posterior wall of the uterus. The extent of invasion is variable, but in severe cases pockets of menstrual blood can be seen in the myometrium of hysterectomy specimens. When a collection of endometrial glands form grossly visible nodules, they are described as an adenomyoma. Oestrogen, progesterone and androgen receptors are found in the ectopic endometrial tissue, making it responsive to hormones. Fig 1 – Pathological findings of hysterectomized uterus. (A) Gross appearance of adenomyosis. Note coarsely trabeculated, diffusely hypertrophied myometrium stippled with foci of ectopic endometrium. (B) Hematoxylin and eosin-stained section of uterus, showing endometrial glands and stroma surrounded by hypertrophied myometrium. The main presenting symptoms of adenomyosis include menorrhagia, dysmenorrhoea, deep dyspareunia and irregular bleeding (10-12%). The dysmenorrhoea is commonly progressive; beginning as cyclical pain, but can worsen to daily pain. On examination (abdominal and bimanual palpation), a symmetrically enlarged tender uterus may be palpable. The definitive diagnosis of adenomyosis is histological, after hysterectomy. Recently there have been some advances in histological diagnosis from specimens obtained at hysteroscopic biopsy. Transvaginal ultrasound – highly observer-dependent, but there is agreement on the signs seen in adenomyosis. These include a globular uterine configuration, poor definition of the endometrial-myometrial interface, myometrial anterior-posterior asymmetry, intramyometrial cysts and a heterogeneous myometrial echo texture. MRI – shows an ‘endo–myometrial junctional zone’ that can be distinguished from the endometrium and outer myometrium. An irregular thickening of this zone is now recognised as the hallmark of adenomyosis. 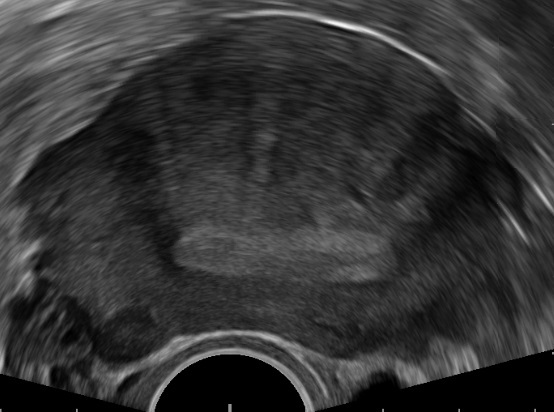 Fig 2 – Adenomyosis indentified on transvaginal ultrasound. The main aim in the management of adenomyosis is to control the dysmenorrhoea and menorrhagia. Currently the only curative therapy is hysterectomy. However, there are other more conservative approaches which may give symptom control. The medical approach to this is as with endometriosis. NSAIDS are used for analgesia, and hormonal therapy for reduction of bleeding and cycle control. It is proposed that the hormones reduce the proliferation of the ectopic endometrial cells, therefore reducing their mass and subsequently decreasing uterine size and volume of blood lost. Continuous combined oral contraception and high dose progestins (e.g. subcutaneous depot medroxyprogesterone) have been seen to temporarily induce regression of adenomyosis. The only definitive treatment of adenomyosis is by hysterectomy. However, other non-hormonal treatments are available. In the UK, uterine artery embolisation can be used as an alternative treatment option in the short and medium term for women who wish to avoid hysterectomy and or preserve their fertility. The aim is to block the blood supply to the adenomyosis, causing it to shrink. Other treatment options include endometrial ablation and resection, laparoscopic excision and magnetic resonance–guided focused ultrasound. Adenomyosis is the presence of functional endometrial tissue within the myometrium of the uterus. It causes dysmenorrhoea and menorrhagia. Likely caused by anything disrupting the uterine lining allowing the endometrium to invade the myometrium e.g. pregnancy, uterine surgery. Seen towards the end of the reproductive years. 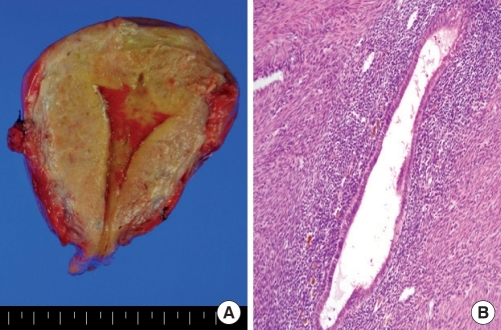 Difficult to diagnose with imaging, histology at hysterectomy definitive. Treatment conservatively with analgesia and hormone control of cycle. Only curative treatment is hysterectomy. Which of the following is a recognised risk factor for adenomyosis? Which of the following is NOT a common symptom of adenomyosis? Which medication is most commonly used to treat the dysmenorrhoea component of adenomyosis? What is the definitive treatment of adenomyosis?